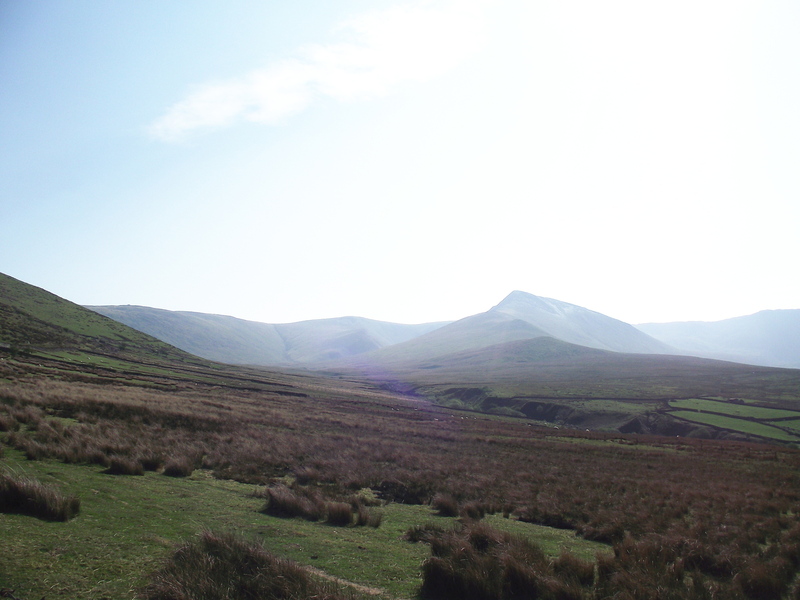 ← #23 – “Oh no, not another flippin’ Whernside”! I had a booking for two customers over Easter weekend. 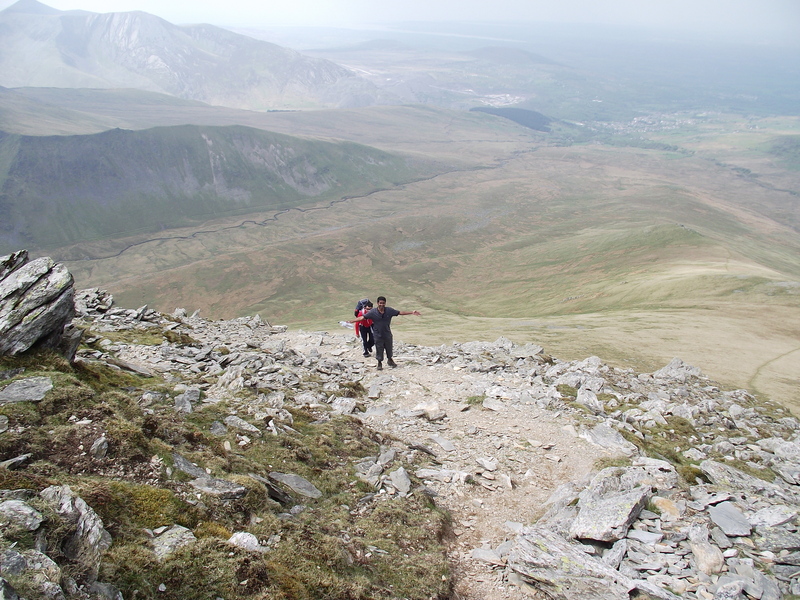 The brief was simple enough – three days walking on interesting hills in Snowdonia BUT away from crowds. The venue also had to be handy for a railway station. Having previously been in Wales on Bank Holidays, with hordes of unfit, sweaty walkers queuing to get up Yr Wyddfa (Snowdon) by the PYG or Miners tracks, I was clearly going to have to use a bit of imagination here. It only took a couple of minutes to come up with the obvious choice – The Carneddau. The Carneddau range in North Wales is big, and I do mean big! It’s the biggest upland mass south of the Scottish border, and you could comfortably move the Snowdon hills and the Glyderau into the space that the Carneddau occupies, and still have room left over. They are surprisingly quiet hills, though. The reasons for that soon become apparent – long walks in and out, high summits and an almost featureless plateau that in bad weather becomes a navigation trap for the unprepared. As I said, the obvious choice. We all arrived at Bethesda at about 0930, Shreyas and Ravi having travelled by train overnight. 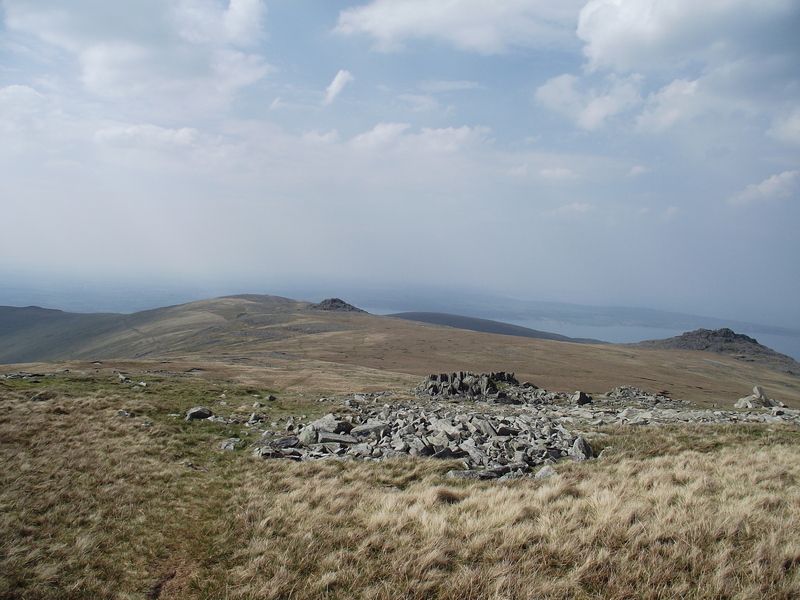 After last minute adjustments to gear we set off for Carnedd Llewelyn (Llewellyn’s Cairn) which at 1064 metres altitude is the highest peak of the Carneddau and the third highest in Wales (Yr Wyddfa is 1085 metres). 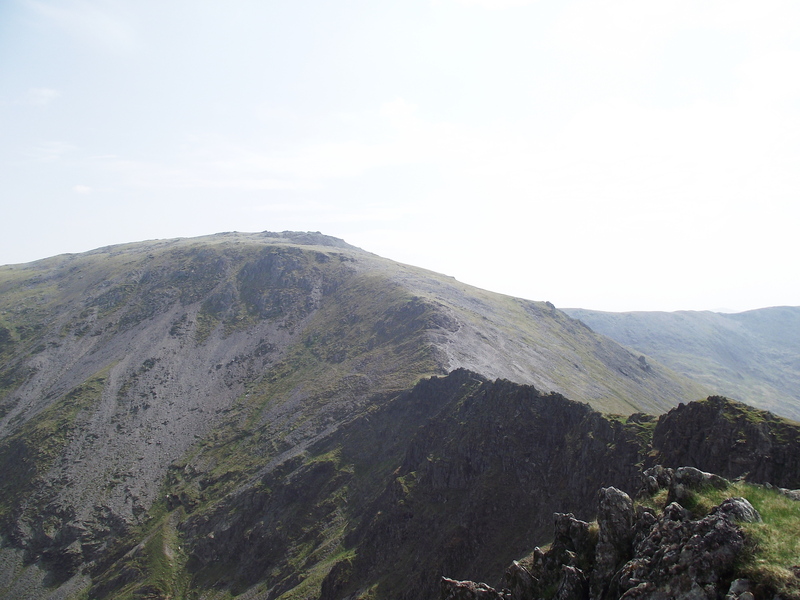 A long easy ridge led us up towards Yr Elen via an unnamed top and Foel Ganol. I don’t speak welsh, but I know enough to translate that as the ‘Centre Bare Hill’, but centre of what? 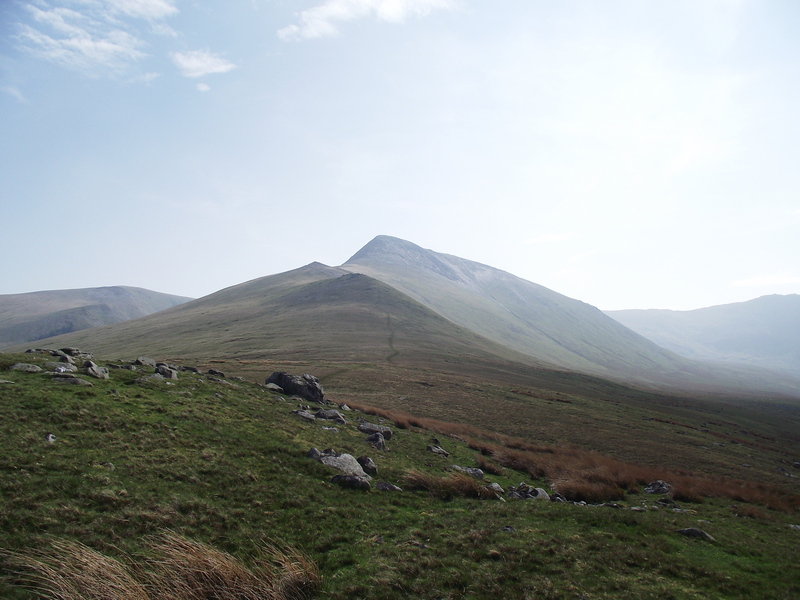 The answer became obvious, with Foel Ganol in the middle of three peaks ending with Yr Elen. Yr Elen saw a transition from grass underfoot to rock, and from below the way wasn’t immediately obvious. Up close, a path could be seen meandering through small outcrops. The summit held one surprise for Shreyas and Ravi – after a long grassy ridge, the east side of Yr Elen plunges down steep cliffs. Fortunately that wasn’t our way, and we lost a bit of height heading south then southeast before the final height gain of the day up to Carnedd Llewelyn. 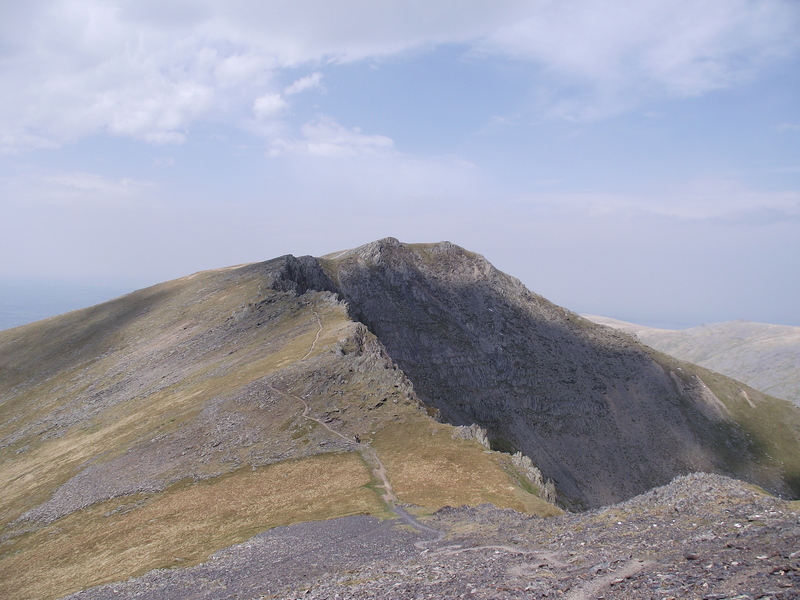 I hope Carneddau fans will forgive me here, but Carnedd Llewelyn isn’t the most stunningly interesting mountain in the world, but it is big and impressive, dominating the view from several directions. We didn’t linger as we still weren’t halfway round the route, though thankfully our major height gain was now behind us, so after a short break we started on the long way back. The long way back in this case was entirely different in character to the outward section – a long, grassy switchback of a ridge, very much moorland in appearance, with the addition of interesting craggy outcrops along the way. The sunny weather had inevitably led to hazy light conditions, not the best for photography or long distance views, but you can’t have it all. Eventually we reached Drosgl, our last peak of the day. 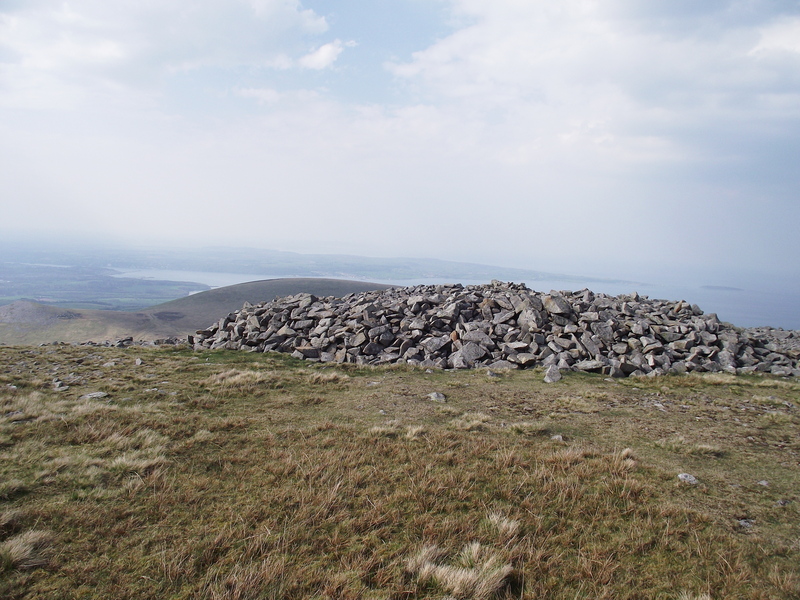 The drama here was man-made – a huge Bronze Age burial cairn on the summit. An impressive place, with a sense of history. So, Day 1 had started the weekend well. Day 2 was to prove more challenging. This entry was posted in 5. 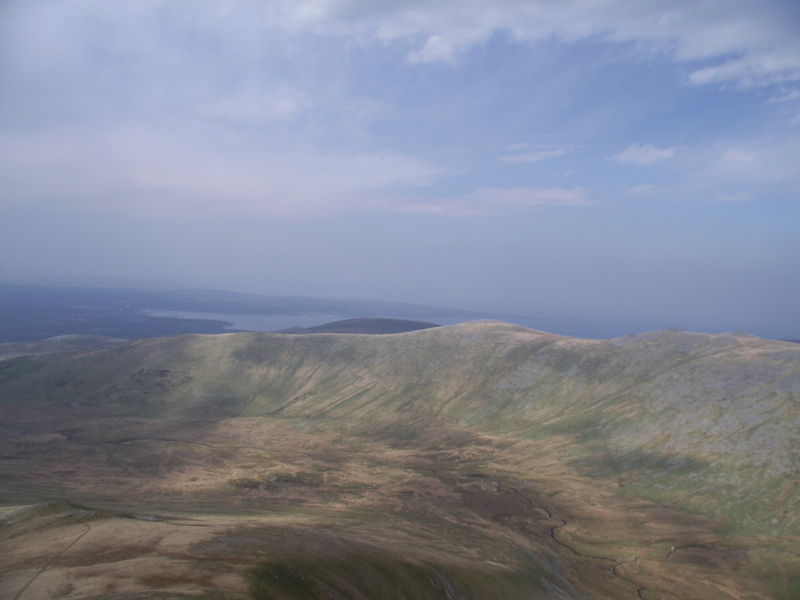 North Wales and tagged Carnedd Llewelyn, Carneddau, hillwalking, mountains, Snowdonia, Yr Elen. Bookmark the permalink. You certainly had better weather than we did last time we were in the Carneddau! Couldn’t see more than 10m and the wind was over 45-50mph. Couldn’t see a damned thing! Great photos and a nice three part trip report. Hi Maz, and thanks for the kind words. 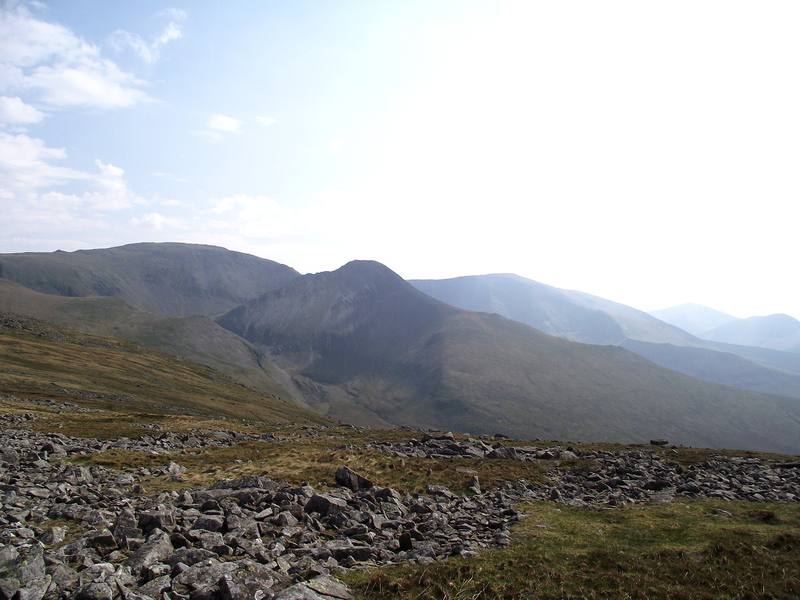 I’m hoping to fit in a Carneddau traverse soon – Ogwen to Conwy. A bit of a monster of a day, but the main problem is getting the logistics right if only using one car – it involves 1 train, 2 buses, and almost 2 hours travel to make the link, but I’m working on it! Just off to check out your blog. I suggested to my two mates I used to walk with in Wales that we went up the right-hand edge of Yr Elen (on your first picture). It’s great fun and there’s a path most of the way to the cwm below it to get started. The ridge is easy and very nice.